Do you need to dredge a body of water or waterway? If so, you might be wondering whether you should choose mechanical or hydraulic dredging for best results. The answer is: It depends. 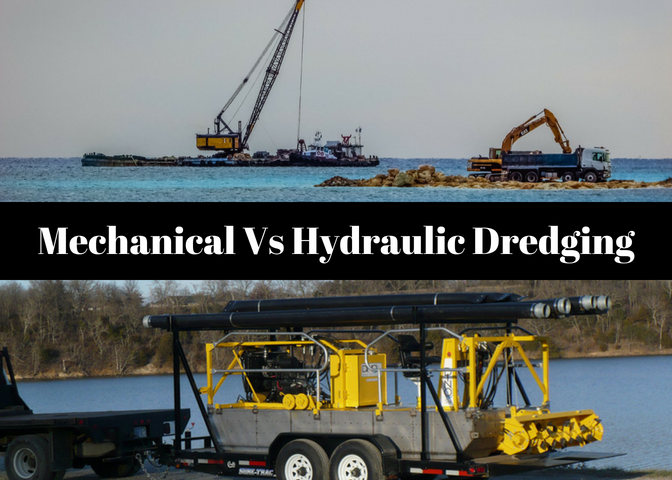 Read on to learn more about mechanical vs. hydraulic dredging so you can determine which option is best for your project. Equipment: Mechanical dredging involves the use of an excavator or another type of heavy equipment — usually situated on a barge or on the water’s edge — to dig out the bed of the body of water and remove the sediment. The sediment is then hauled away for disposal or reuse. In contrast, hydraulic dredging uses suction to remove the sediment, which is then transported through a pipe and deposited elsewhere to be disposed of or recycled. A certain amount of skill and experience are required to achieve the optimal suction setting for different bodies of water and types of sediment. Intended dredging area: Location can play an important role. For example, hydraulic dredging is a good solution for areas where environmental concerns are important. Generally, mechanical dredging is well-suited for locations that require a high degree of precision since in most cases mechanical dredging allows for more mobility. 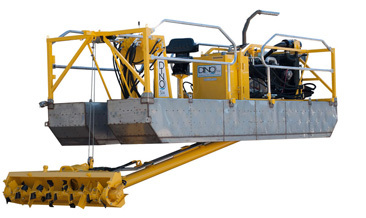 This is why GeoForm International invented the Dino6- which is a hydraulic dredge that has increased mobility and precision compared to larger hydraulic dredges. 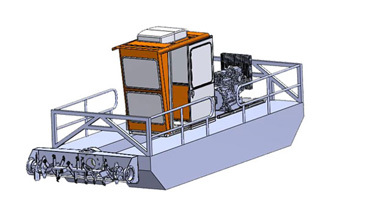 Type of dredge material: While dredging in itself can remove a variety of bottom materials, the two methods are best suited to different kinds of materials. Because mechanical dredging equipment is robust and doesn’t filter the dredge material, it’s most often used to remove rock and gravel. Hydraulic dredging equipment, on the other hand, is best suited for removing fine silt, sand and dirt. Material suspension: Material suspension refers to the fact that during dredging, certain amounts of dredge material — which can include contaminants — are stirred up and are suspended in the water. This is especially a concern with mechanical dredging. 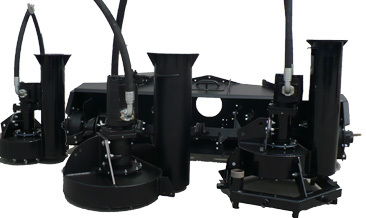 Hydraulic dredging, in contrast, uses a cutterhead shroud to contain the suspended material so it can be pumped away. In short, when it comes to mechanical dredging, benefits include speed, mobility, and accuracy, as well as the ability to handle larger dredge materials. However, its drawbacks include the high percentage of resuspended sediment, plus the costs of acquiring, operating, and maintaining the required heavy equipment. Its disadvantages include the fact that it’s not suited to removing larger or coarser dredge materials. Plus, it can take longer than mechanical dredging, depending on the site. If you’d like to know more about the benefits of hydraulic dredging, contact the team of experts here at GeoForm International. With more than 20 years of experience providing top of the line dredging solutions to customers across the globe, we welcome the opportunity to answer your questions and discuss your dredging needs. To learn more, please fill out our contact form or call 913-782-1166.